It’s been almost 10 years (!) since I last updated my “Unusual Greens” series — I haven’t been exploring markets like I used to and the places I shop almost always have the same few greens (chard, kale, rapini, etc.). Today’s featured greens are Moringa oleifera leaves (a.k.a. drumstick tree, horseradish tree, Tree of Life, Miracle Tree ). I found them in a round-about way. At the following week’s Berkeley Farmers Market (Tuesday), I noticed that one of the farmers had bundles of moringa leaves for sale. I bought a bunch, and, when he asked me “What are you going to do with them?”, I was unable to give a good answer because I didn’t know. When I got home, I started hitting the books and internet to find out more about the ingredient. Painting of moringa oleifera leaves, pod and etc. About that word “unusual”: in my series, I use the word to refer to a green that you won’t see at major grocery chains like Safeway, Kroger, or Whole Foods in the U.S. In other nations and in specialty markets, of course, the greens might be easily available (and perhaps even so common that they are one of those greens that children hate: “Awww Mom, not those yucky drumstick leaves again!”). In India, for example, moringa has been known for more than 2,000 years  . It grows well in tropical climates around the world — a Food and Agriculture Organization (FAO) post naming moringa the traditional crop of the month notes that it is an important plant in India, Ethiopia, the Philippines and the Sudan, and also cultivated in parts of Africa, tropical Asia, Latin America, the Caribbean, Florida and the Pacific Islands. The root was used by the colonial British as a substitute for horseradish, hence the name “horseradish tree,” but these days it is not recommended to eat the root because of toxins (alas, I forgot where I read this). Moringa might be more famous for its pods — often called “drumsticks” — because they are a standard item in the South Indian soup/sauce called sambar that is common at South Indian restaurants. The exterior of the pod is too hard, and it’s the soft interior that people scrape out and eat. Superfood: maybe; crop diversity: yes! Moringa is touted as a “superfood” because of its impressive nutrient profile: relatively high in protein, stocked with vitamins and minerals. I’m not a big fan of the concept of superfoods, believing instead that diversity of diet is a better approach than concentrating on a few superfoods. My line of thinking is often like this: Was I feeling energetic on Tuesday morning because I had some superfoods for breakfast, or was it because I got a good night’s sleep, or because I rode my bike to work, or because I made my tea stronger than usual? Who knows? But I am a big fan of crop diversity — it’s good to have more than the usual handful of varieties (chard, kale, collard), as they help build a diverse diet, preserve agricultural genetic diversity, and can help reduce pest problems on farms (a monoculture is much easier for pests to demolish than polyculture). Leaves are rich in protein, vitamins A, B and C, and minerals – highly recommended for pregnant and nursing mothers as well as young children. Plant produces leaves during the dry season and during times of drought, and is an excellent source of green vegetable when little other food is available. If you want to learn more about moringa’s nutritional profile, it won’t be hard to find information — today’s Google search for “moringa nutrition” turned up half a million results (no quotes in my search). The challenge will be filtering out the hyperbole (superfood!). The leaves are easy to strip from the branches, a breeze compared to kale. In fact, I felt a little like a large herbivore while stripping leaves, as if I was in a wild-life documentary about herbivores (if I ever made a video about moringa leaves, it would ideal to have Sir David Attenborough do the narration for the leaf stripping…). “I’m eating a the leaves of a tree” — how often can I say that? Almost never (I use bay leaves a lot, but don’t actually eat them). The flavor is pleasant, fairly spinach-like, with a bit more grassy-ness than your average green. On the other hand, once the leaves are stripped and get wet, they stick to everything (good old surface tension…). I cooked it like kale or chard: heat oil in skillet, add minced garlic, cook for 15 seconds or so, add the greens and a little water, lower heat, cover. Thinking of it as a direct spinach substitute, I added cooked moringa leaves to the filling for vegetable and cheese pies by adapting the recipe I posted previously. I started with about 200 grams of chopped leaves, cooked them in a skillet, squeezed out the water, let them cool, and mixed them into the cheese filling. With its long history, widespread cultivation, and superfood reputation, moringa leaf recipes are not hard to find. Scouting Pinterest and stripping away the many pins on nutritional information or using moringa powder as a supplement, I created a Moringa oleifera board. 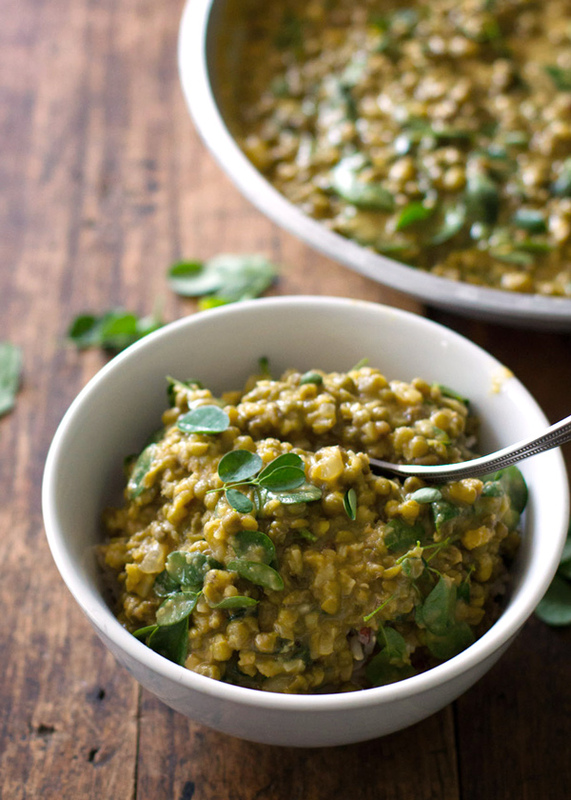 Two that caught my attention were 14 ways to cook moringa leaves from Saffron Trail and a hearty Filipino monggo beans soup (or mung bean soup) from Pinch of Yum. When it comes to using moringa like a supplement — i.e., adding a spoonful of powder increases the superfood quotient of your preparation — you’ll find some creative recipes, like chocolate truffles with moringa powder from Jennie Schacht or pancakes with moringa powder from Sweet Kabocha. Shelf-stable moringa powder is making its way into grocery stores with a natural foods emphasis (I saw products from Kuli Kuli at Berkeley Bowl last week), but have you ever seen moringa leaves in a store in the U.S.? 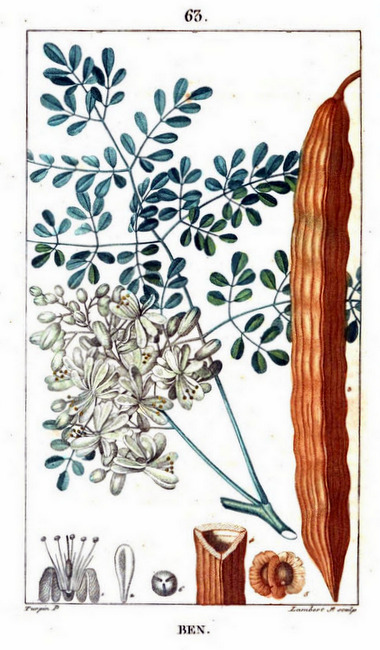 Painting of moringa oleifera leaves, blossoms, pod, and etc. from Flore médicale, by F.P. Chaumeton, illustrated by E. Panckoucke and P.J.F. Turpin, published by C.L.F. Panckoucke (Paris), 1815. Digitized by Google Books, original from Sapienza University of Rome (Biblioteca di Biologia Ambientale. Photo of monggo beans soup from Pinch of Yum. Used under terms listed on their FAQ page.